Magritz's Non-consent to Fraudulent "Civil Cover Sheet"
Magritz had carefully studied and considered filing a "Civil Cover Sheet". Through research he discovered that for him and the type of suit he was filing, the "Civil Cover Sheet" was not only inappropriate, but would be detrimental considering the nature and cause of the suit he was filing. Thus he Noticed the Court that he would not be filing a "Civil Cover Sheet" and that such a document was not applicable. So, some unknown named person, who concealed his or her identity behind the initials "NCD" on the signature line, purportedly indicating "New Case Desk", created the fraudulent "Civil Cover Sheet" without Magritz's consent and over Magritz's objection. 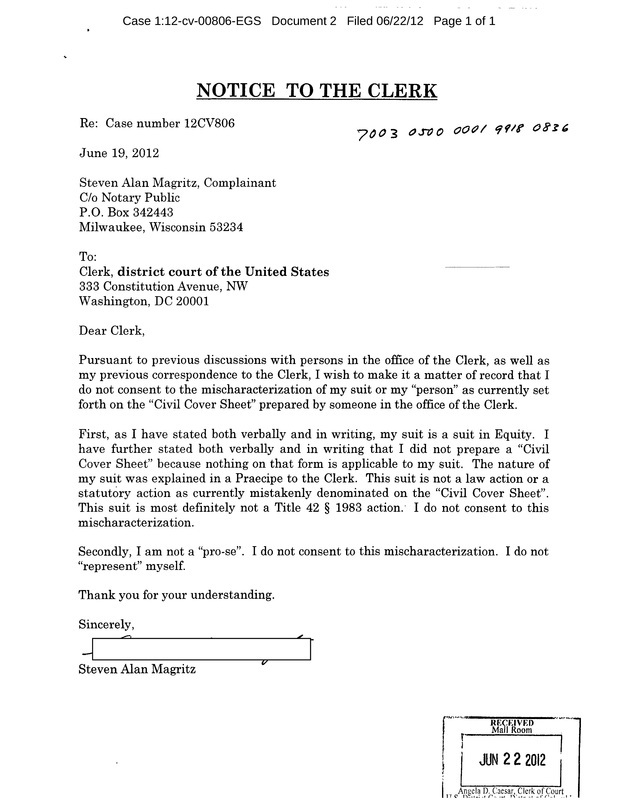 When Magritz called the clerk's office to question the fact that some unknown named person created a cover sheet over his objection and without his consent, no one would admit to having prepared the fraudulent "Civil Cover Sheet". Since his lawsuit had been previously returned based upon the false pretense that it was not "double-spaced", the dark clouds were gathering fast. Magritz called the clerk's office a number of times over the ensuing months, and as the questions he asked became more pointed, the persons on the other end of the line became less and less cordial, even to the point of becoming hostile. It was apparent from their responses that "the fix was in"; they knew about it, Magritz knew about it, and they knew that Magritz knew about it. And they evidently felt uncomfortable talking to someone who they were, directly or indirectly, giving the shaft to, and who knew he was being shafted. Magritz was maintaining composure by referring to the intentional false representations as a mistake and "mischaracterizations". But the dolus from the clerk's office, and on the unsigned "Orders" from the Court, presumably from the "judge", soon became egregious.